W&L Faculty and Staff Lace Up for First-Annual 5K In total, 89 members of the W&L community ran the race. W&L’s first annual Live Well 5K. 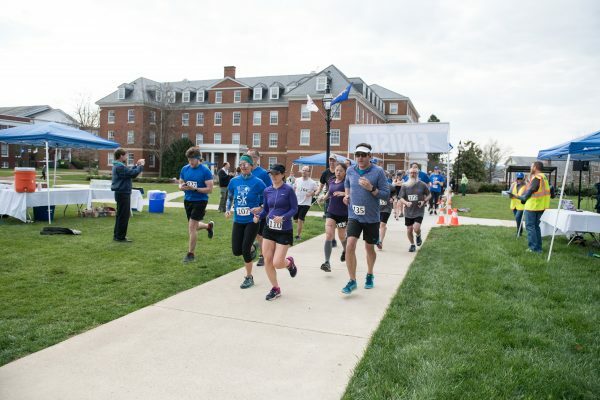 During spring break, Washington and Lee University faculty and staff put on their running shoes and slid on their sweatbands to run the university’s first-annual Live Well 5K. Mary Main, executive director of Human Resources, came up with the idea for the campus 5K, and preparations for the race started in December 2017. Everyone in Human Resources pitched in to plan the event. In total, 89 members of the W&L community ran the race and 33 volunteers —Human Resources staff— helped make it happen. There were 26 course marshals on the running path. The course began on Cannon Green and circled around the law school, with lots of stairs and Colonnade crossings along the way. Remington said everyone seemed to enjoy the course but it may change next year in order to remove some of the stairs. Blake Shester, technology integration specialist, won the men’s division with a finish time of 23:56:1 and Helen MacDermott, office manager in the Center for Global Learning, was the first woman to cross the finish line with a time of 24:28:9. Associate Dean of Students Tammi Simpson (center) and Director of Sustainability Initiatives Kim Hodge (right) have fun in the first-annual W&L 5K. First-place men’s finisher Blake Shester. First-place women’s finisher Helen MacDermott. President Will Dudley participates in the first-annual W&L 5K.